When you help reduce pollution, you're helping to make a positive impact on our entire community. Remember – every drop counts! Working together, we can achieve our goal of cleaner water faster for all of Richmond. DPU has resources available for presentations to community groups, neighborhood associations, schools, churches and other groups. Please contact interim Community Outreach Coordinator Jonét Prévost-White at Jonet.Prevost-White@richmondgov.com to schedule a presentation for your organization. Rain barrels are a great way to collect and store runoff water from roofs for future use. Water that would otherwise end up going down a storm drain can be used for washing cars or watering plants, saving many gallons of water over time. Plus, rain barrels are a great way for homeowners to beautify their property and reduce their stormwater fees. The “Build a Barrel – Save the Bay” rain barrel program was created by the Richmond Stormwater Utility to educate elementary school students about stormwater pollution. As a part of the program, rain barrels were donated to each elementary school in the city for students to paint and decorate. The winners of three categories – Best Environmental Message, Most Outrageous and Most Creative – were selected through a public vote, and the winning students were treated to an ice cream social. The winning designs were then displayed at the Earth Day Festival in Richmond and at the Richmond Public Schools STEM (Science Technology, Engineering and Math) Science Fair in April of 2014. The Stormwater Utility implemented a stormwater credit program in 2010, which allows homeowners to qualify for a credit of up to 50% on their stormwater fees when they apply prescribed best management practices, including installation of rain barrels. The "Build-A-Barrel" program has also been beneficial to senior citizens, who were able to sign up to receive one of the barrels at community meetings. 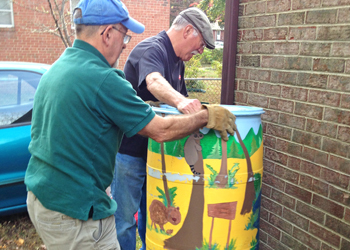 The city partnered with the James River Association, a nonprofit organization that works to protect the beauty and health of the James River, and provided volunteer expert rain barrel installers to install each of the barrels for the senior recipients. A rain garden is a landscaped, bowl-shaped garden, specially designed to soak up stormwater coming from roofs, driveways, parking lots, lawns and other surfaces. By using plants, mulch and soil, these gardens create a space where water can slowly filter into the ground instead of into a storm drain – a beautiful way to help reduce runoff and remove pollutants. Rain gardens capture the first flush of water from a storm, before it enters our waterways. The pollutants break down in the soil over time, and the runoff is naturally filtered as it moves into and through the garden. In 2012, Chimborazo Elementary School became the first Richmond Public School to install a rain garden as a part of DPU's educational outreach program to teach students about the importance of stormwater and pollution prevention. In 2013, another rain garden was designed and installed at Holton Elementary. Through green projects, DPU and others seek new ways to protect and improve Richmond's natural water cycle, benefiting both the environment and our community. One effective green project is a bio-infiltration planter, or stormwater planter. These planters are designed to capture stormwater runoff while filtering out sediment and pollutants. Examples of this type of planter can be seen to the right. Another kind of green project seen in Richmond today is a green roof, meaning a rooftop planting system that contains live plants. Among the benefits of this type of roof: a reduction in stormwater runoff, energy savings (green roofs offer natural insulation, reducing heating and cooling costs), and a long lifespan – longer than the average lifespan of traditional roofs. Throughout Richmond, DPU's Stormwater Utility assists local community groups to help sponsor programs that encourage citizens to get directly involved with cleaning and beautifying their environment. One example of these community clean-up events took place on Saturday, August 23, 2014, in the Swansboro West neighborhood. The alley behind Darden St. and Wythemar St. was littered with tires, mattresses, chairs, wood and trash. Clearly, the alley had been used for years as a place to dump tires. Twenty-seven volunteers came out to help with the clean-up, including members of the local neighborhood, Koinonia Church, Morning Star Baptist Church, Swansboro Baptist Church, and attendees of the Council District 5 and Council District 8 meetings. Working together, the Stormwater Utility and the volunteers collected 5,040 pounds of trash, including 400 tires! Here are some links to our partner organizations and information about the things that they are doing in support of our common goal of bringing cleaner water faster to all of RVA.